“To Bill and Melinda Gates, Christa Moya, and the American Indian Graduate Center your ten years of financial support and student support has given me a lifetime of opportunities. Without your support, my educational dreams would not have transpired into real-life experiences. Thank you!" 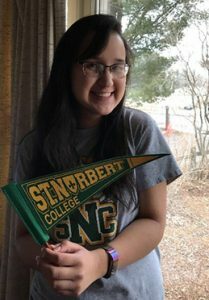 My name is Ruthie Tucker and I am a first-year student at St. Norbert College. I’m studying Elementary Education and minoring in art, and I am in the St. Norbert College Honors Program. Also, I have been working as a Research Fellow in which I am able to aide a professor in their research and work collaboratively. During my first semester, I was able to form an organization called “Council of Indigenous Peoples.” I wanted to create a community in which Native Students, like myself, could feel like a family on a predominately whole campus.